This tree is heavily cover-based, with high burst and sustained DPS, but little maneuverability when played straight from cover. This has been deemed by the community a more PvE-based spec, but it can be used in PvP very effectively. The key is making the most of movement and using terrain efficiently so as to minimize the movement required. Five of a Gunslinger’s normal skills in particular get multiple buffs. Hightail It, the new level 51 skill, gets a buff with the talent Stay Low. Hightail It gives you 3 seconds of Hunker Down in this spec. Flourish Shot on the run, then drop into cover for a Sabotage Charge. This sets up a nice little bit of burst damage to come. Smuggler’s Luck, followed by a now auto-crit Charged Burst (which is instant due to the recent use of cover). Aimed Shot with a 1.5 second cast due to two uses of Charged Burst, followed immediately by Trickshot. After that initial burst, it may be that the target is going to be low enough for a Quickdraw, which you could follow with a Trickshot if they don’t die. In general, use the buffs you get from Illegal Mods and Burst Volley to facilitate super powerful burst damage. I like to use Speed Shot -> Trickshot -> Burst Volley ->Illegal Mods -> Speed Shot -> Trickshot -> Charged Burst x2 -> Trickshot -> Aimed Shot -> Trickshot. This rotation does a lot of damage, and it capitalizes on the Illegal Mods buff as much as possible. Use cover to prevent jump attacks. Pop in and out occasionally after CCing jumpers to reestablish Ballistic Dampers. Use Hunker Down early to prevent CC from being used. Cast XS Freighter Flyby on yourself when fighting melee classes. Sharpshooter has more core talents than the other two trees, as there are too many good skills that synergize well. There are a total of 26 points that I basically cannot live without in my builds. This does not allow for a lot of variation, except in the other two trees. I. Ballistic Dampers (2/2) – This grants 3 charges of a 30% damage-absorbing shield upon entering Cover, which means that you will take less damage. This allows the use of the Dampers Defense strategy. I. Steady Shots (2/2) – Increases the damage of Charged Burst, Speed Shot, and Wounding Shot by 6%. You will use these skills a lot, so any straight up damage boost is good. I. Sharpshooter (3/3) – Increases accuracy, which unless you are “capped” in accuracy, means more DPS. The long term battles are really impacted by the extra 3%. II. Sharp Aim (2/2) – Aimed Shot ignores 20% of your enemies’ armor, which means your hard hits hit harder. III. Snap Shot (2/2) – Entering cover has a chance to make Charged Burst able to be activated instantly, which means Cover = instant damage to your enemy. III. Charged Aim (2/2) – Stacks up to two times, Charged Burst decreases the activation time of Aimed Shot by 20%. IV. Slick Shooter (2/2) – Increases critical hit chance of Charged Burst, Speed Shot, and Trickshot by 4%, and increases armor penetration by 10%. IV. Rapid Fire (1/1) – Decreases the cooldown on Aimed Shot and Speed Shot by 3 seconds. IV. Foxhole (1/1) – Increases energy regeneration by 1 per second while in Cover. Great for sustaining the DPS. V. Recoil Control (2/2) – Newly revamped in 2.0, this skill decreases the activation time of Speed Shot by 30%, and it additionally resets the cooldown of Trickshot on the use of Aimed Shot, Quickdraw, two Charged Bursts, or a complete Speed Shot. V. Trickshot (1/1) – Gives a high-DPS skill that is only usable within 5 seconds of Charged Burst, Aimed Shot, Quickdraw, or a complete Speed Shot. Should basically be used between every other skill. VI. Deadeye (3/3) – Increases critical damage from Speed Shot, Quickdraw, and Trickshot by 30%. No option, this is crucial for sustained DPS especially with a high crit chance. VII. Smoking Barrels (1/1) – Trickshot reduces cost of next two Charged Bursts. This is great for sustained energy management. VII. Aim High (1/1) – Increases crit chance of Quickdraw and Speed Shot and reduces their energy cost by 3. Good for more DPS and energy management. VII. Burst Volley (1/1) – Grants a skill that immediately ends the cooldown on Speed Shot, and grants extra energy regeneration as well as 10% bonus Alacrity. On a 45-second cooldown, this is a great skill for use in high-demand scenarios, especially when paired with Illegal Mods. II. Cover Screen – Allows you to keep the ranged defense buff from cover when moving for 6 seconds following leaving cover. This is a pretty useless skill. Ranged defense is only 1/4 of the attack types. II. Percussive Shot – This skill adds knockback to Aimed Shot when used within 10m. This can be handy to get mobs off of you and back into the range of the tank’s AoE’s. This is also the perfect thing for knocking enemy players off of bridges, out of the shield in Ancient Hypergates, and it is a great tool against melee players. It can wreak havoc in PvE sometimes though, so I don’t usually take it in PvE. II. Trip Shot – Reduces the cooldown on Leg Shot, our root. This is a fantastic skill for PvP, but not for PvE. It becomes a slow after it breaks if you take the talent Kneecappin’. III. Diversion – This pops enemy players out of cover and reduces accuracy by 45%. Does not work against raid bosses. Great for PvP against certain classes, bad in PvE. IV. Spacer – Pulse Detonator pushes enemies farther back, reduces cooldown on XS Freighter Flyby. Good for certain situations, but not all situations. V. Lay Low – Lowers the cooldown on Hunker Down and XS Freighter Flyby by 15 seconds. This is great for PvP or PvE, as Hunker Down is unique as the only presciently-used CC immunity in the game, and XS Freighter Flyby is a ton of damage, but it is situational. V. Heads Up – After Hunker Down ends, you gain a 50% speed boost and immunity to movement-impairing effects. Great in conjunction with Lay Low and Stay Low. VI. Holed Up – Hunker Down now mitigates up to 60% of AoE damage. This is good against certain classes and in certain boss fights, but it is not an all-the-time kind of talent. VII. Stay Low – Increases duration of Hunker Down by 3 seconds, and when you use Hightail It, it grants 3 seconds of Hunker Down. All together, this means approximately for every period of 45 seconds, you can be CC-immune for 29 seconds of it. VII. Kneecappin’ – A great skill for PvP, but not for PvE. This skill increases the Trauma debuff from Flourish Shot by 6 seconds and adds a 70% slow for 3 seconds after Leg Shot wears off. This build takes the Sharpshooter talents Lay Low, Holed Up, Heads Up, and Stay Low for maximum AoE-survivability. This spec is great for Flashpoints, as the adds generally go down quickly. From Saboteur, this build takes Cool Under Pressure for the extra healing (to make healers’ lives a little easier), Bravado for extra energy, Streetwise for extra cunning, and Underworld Hardships for extra health. There is also one point in Independent Anarchy for a slightly better Sabotage Charge. This is almost the same exact build as the Single-target Survival build, but the secondary trees are a little less focused on staying alive. This is when the healer is fully competent and you need the max DPS. From Saboteur, we take Bravado and Streetwise like in the Single-target Survival build. We also add another point to Independent Anarchy for increased AoE damage and increased damage on Sabotage Charge, which is a regular part of our rotation anyway. We finally add three points to No Holds Barred from Dirty Fighting for extra crit chance. While I personally think that Gunslingers are better off leveling in Saboteur, some might prefer Sharpshooter. If so, this is the build I would use. Here is my list in order of what I would take, complete with respecs. Here you are level 32, so I would go ahead and get Cool Under Pressure from Saboteur if you start having difficulty with mobs on Balmorra. Get Lay Low at this point because of the usefulness of CC-immunity. Pick up Deadeye for the DPS boost.When you get to level 40, respec and drop Cool Under Pressure and get Holed Up for the damage reduction and Aim High for the awesomeness that is crit chance and energy management. This is my favorite PvP Sharpshooter spec. This has Trip Shot (for a shorter cooldown on our root/slow), Lay Low for the reduced cooldown on Hunker Down, and Spacer for the faster activation time on XS Freighter Flyby. It is ideally suited for 1v1s and playing a fast, burst-y style in Warzones. There is a lot of time spent in cover, so we take the Hunker Down talents. All of them. In Saboteur, we take Saboteur’s Utility Belt and Streetwise, as well as Independent Anarchy for the extra AoE damage. We also add in Cool Under Pressure since we are in cover a lot anyway. Might as well regen health. This build eschews talents that keep one stationary, like Foxhole and Ballistic Dampers. Instead of those, it takes mobility-based buffs. Movement in and out of cover at the right times is crucial for this build. This is more of a PvP build, but is also good for the random Flashpoint bosses that require a ridiculous amount of movement. This is not the best spec for PvE DPS though. This build takes talents from Saboteur. With Streetwise and Bravado, it starts like some of the other builds. In addition to that, we take Pandemonium, which gives us another instant-cast Charged Burst. In this spec, you can use Pulse Detonator -> instant Charged Burst -> move out of cover then back in -> instant Charged Burst ->Trickshot -> fast Aimed Shot. This can keep a melee off you for a while. Finally, we take Holdout Defense from Dirty Fighting for the speed buff from Blaster Whip. 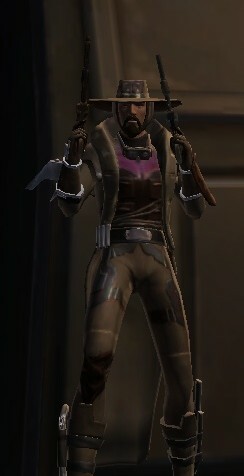 Well… I’m just a newbie in SWTOR and that gide helped me a lot in understanding the class mechanics, that is why i wanted to thank you, man!! But, if it is posible, could you please add the priority of stats (cun, pwr, crit, etc.) for PvE and PvP? This changes a lot, depending on spec. For SS it is Cunning, Power, Accuracy to 105%, Surge to 75%, Crit. For DF it is Cunning, Power, Crit to 35%-40%, Surge to 75%, then Accuracy. Reasons for these is SS needs a lot of Accuracy, due to a lot of weapon-based ranged attacks, Sab needs more Surge and Crit due to a few buffs that increase crit damage, and DF needs a lot of Crit to keep your Energy levels up. Where you can, put Power in.